Most Sundays my boyfriend and I spend time running errands and enjoying a relaxing day. This last Sunday was cold and wet and I needed an outfit that was comfortable and warm. 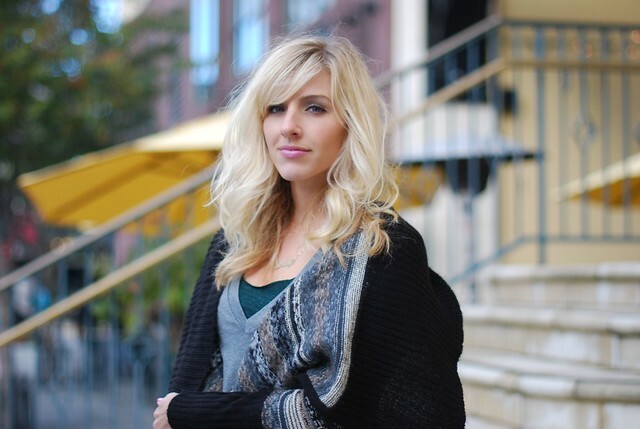 My new Kensie cardigan kept me warm and was perfect for layering with my Bella tops. I also love my new Sterling necklace. Who doesn't love channeling their inner Carrie Bradshaw? I'm thrilled to announce that one lucky reader will win the Bella tops (gray v-neck tee and emerald tank) that I'm wearing in this post. They are seriously comfortable and versatile. I can't stop wearing mine. -Become a fan of Bella on Facebook and follow them on Twitter and confirm in the comments. If the tops I am wearing are unavailable you will win something similar. Sorry, US readers only. The winner will be randomly selected next Monday at midnight Pacific Time. Good luck! very cute. The rain was crazy this weekend! I really like the little peek of hunter green that you layered underneath :) nice touch. I love the outfit!your ballet shoes are just so adorable. You look so cute and casual! love the nameplate necklace! May have to add that one to my christmas wish list! You look so snuggled up and adorable, love that cardigan! The tops are cute. I am really loving the new sweater too! they look so cute and comfy! All done .... I participate willingly! you and your blog are fantastic ! What a fab give-away, too! I'd never heard of Bella before but after checking out their site, they are clearly putting out some super comf clothing and great basics. Your outfit is fabulous, the shirts really look comfortable! Thanks everyone. Please enter to win both tops by leaving a comment that you have entered and join them on FB and Twitter. Loves the necklace! What size did you get? Love everything about this outfit! I've joined bella on facebook and twitter and absolutely love this giveaway!! I love your cardi and necklace! Thanks for the giveaway. Hope to win! 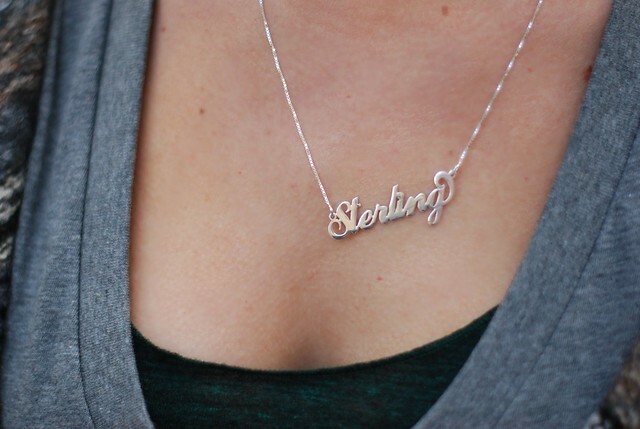 Love your Sterling necklace, love that you referred it to your "inner Carrie." I have joined them on both Twitter and Facebook. Not eligible...But I blogged your giveaway! Cute and casual! The cardi looks so cozy. I could use a similar one as the temps begin to drop. Great necklace, Taylor! I love it. Cute outfit! I am now following Bella on Twitter and a fan on Facebook. love the kensie cardigan! i love love love their stuff! & i'm now following bella on twitter & fan-ed them on fb! Cute outfit Taylor! I'm a Follower and just "liked" Bell a on FB! Great layering pieces. I now "like" and am "following" Bella on FB and Twitter. following on FB and Twitter! Cute outfit, love your necklace, I was thinking about getting one for me too but it happened to me a couple of times before with a school hoodie that had my name on it, that people I don't know start calling my name it's weird and also could be dangerous haha. That sweater is just so gorgeous! You look adorable! Love the look from Bella. but i gotta say- you look stunning. your hair looks amazing and the wrap is so nice! I love your "Carrie" necklace. There are so many similar ones out there, but most look so cheap. Yours is beautiful! hello :) i really like the cardigan! its definetly perfect for weekend errands. have a happy day! You look so cozy and cute!! And I love that you're in Santana Row - I miss that place... I used to go every weekend when I lived down in that area. Must make a trip soon now that it looks like the xmas tree is up!! yay! Love the necklace. Following on fb and twitter! I am a follower of Bella on FB and Twitter. fb fan & twitter follower. p.s. I reallyyy love the carrie-esque necklace! Great look! I just picked up a similar sweater at Forever 21...now i know how I will wear it!! I love that sweater you have on. It was the first thing that I noticed. These pictures are so beautiful... they're so holiday that makes me so happy! You look gorge as always. Then necklace is a classic thanks to Miss Bradshaw. I am fanned Bella on fb, but I don't have a twitter account.. .can I still enter??? Yay! I'm excited for this giveaway. As always you look great! Such a cute outfit and necklace! What size necklace did you get? Following on Facebook and Twiiter! I've been searching for a sweater exactly like this! I could always use more basic tees!!! I am a fan of Bella on Facebook and I follow them on Twitter. Great giveaway! Love your outfit too! I am a fan on FB and follow your twitter! Cuuuutte! Im a fan of both! You look so gorgeous! Love that kensie cardigan. I want it!! I'd love to win! I need some new basics. fantastic giveaway. I am a fan on facebook and I follow on twitter. oh wow! I love it! so need these in my wardrobe! Cute bag! and I really like the blog.